For several months now, I've heard all of this talk of hyperinflation. I'm sure you have too. I've seen that word so many times over the past year that I might have even used it without realizing it. As I wrote in the original edition of America 's Financial Apocalypse, “inflation is certainly going to be a very big problem.” I stand by this previous forecast first made in 2006. However, hyperinflation isn't going to occur. While I may be wrong about some things in the future, I won't be wrong about this. Quite simply, America would go to war before allowing hyperinflation to set in. It seems as if those who keep talking about hyperinflation are claiming it will occur because they read it elsewhere. So who are the propagators of this ridiculous rumor? They are primarily the gold bugs who are trying to manipulate the gold and currency markets. These are largely the same individuals who fail to realize that gold isn't a hedge against inflation. On the contrary, it's a hedge against deflation, as well as during periods of crisis. It just so happens that periods of crisis are frequently accompanied by inflation. Regardless, this hyperinflation scare tactic has spread like a deadly virus, infecting the investment decisions of many naïve investors. Now who am I to denounce the claims of hundreds of so-called experts? Understand that I was one of the few out there who predicted all that we see today in my 2006 book. This book continues to serve as a crystal ball for news headlines. My online updates since then have provided even further guidance; not commentary on news – real forward guidance. Have a look. http://www.marketoracle.co.uk/UserInfo-Mike_Stathis.html Since the books were released, I've been contacted by numerous individuals who told me they had either moved their 401(k) to cash in 2007 and early 2008, or they made a considerable amount of money based on the information and general guidance provided by the book. And guess what. I didn't plaster the name of my company all over the book, and I wasn't trying to get investors to send me their money. Understand that I'm not someone who has been preaching doom for several years, so I've demonstrated an ability to think clearly. Finally, I'm not in the business of selling gold, nor am I seeking investment business, so I have no agendas. I get paid to be right, not to market false claims. Therefore, any pieces I submit to the public are for the benefit of the public. They aren't marketing pieces to drum up business because I don't deal with retail investors. This separates me from the rest of the pack. Perhaps my most prominent distinction is my track record. If Warren Buffett had been patched into my advisory service, he wouldn't be facing a period of depression similar to the one staring America square in the face. The same could be said of Ken Griffin (Citadel, down 53% in 2008), Jefferey Glendale (down 91% for 2008), and hundreds of other “astute investors.” After see a brief glimpse of my track record, you should really wonder why the mainstream media has ignored me. It's been intentional because they don't want you to know the full truth. The truth would jeopardize their financial and political agendas. In the end, Karma serves as the justice system for everyone. General Electric (owner of NBC, CNBC, MSNBC, etc.) is now facing its judgment day, as are most newspapers, radio and TV stations. And I must say, I love it. The point I'm trying to make is that I am the only credible expert with no agendas, and who has not been a perpetual doomer. Yet, I predicted this mess in much greater detail than any of the agenda-filled doomers; you know, the guys pushing gold and trying to get you to invest with them; the guys who have been preaching the same doom and gloom for fifteen years or more; the same guys who will be preaching the same doom and gloom twenty years from now. In fact, the accuracy of my forecasts and comprehensive understanding of America 's problems have positioned me as the leading expert on this economic crisis, bar none. The two books I wrote already represent the most accurate depiction of what we see today. And they will continue to serve as a crystal ball for many years to come; guaranteed. Yet, most people chose to listen to the media hams, assuming they know what's going on, when the reality is they have no idea what they're talking about. And they certainly aren't on your side. Even the doomers you hear about are hacks. But they aren't Wall Street hacks. They're hacks for the gold and currencies markets. They simply have no credibility. You need to wake up and realize that. All they're concerned with is lining their pockets. If you don't see this reality, I regret to say that you're a sheep. What Am I Saying Now? Now that I've made a case for why you should listen carefully to what I say, I want you to write this down and post it by your computer – the chance hyperinflation occurring our life time is null, goose egg, zero. Yet, so many out there keep trying to scare you with this term. If you look for agendas you're sure to find them. Ask yourself if these soothsayers deal in gold. Ask yourself if they deal in currencies. If they don't they could still be trying to manipulate the market. Otherwise they're only guilty of being ignorant. Either way, they will be proven wrong. To all those who claim hyperinflation is on the way, I suggest you look up the definition because it's clear to me you don't know it. While America is certain to experience a period of very severe inflation, it certainly isn't going to lead to hyperinflation. While there is no standard definition of hyperinflation, it's typically characterized by an increase in the inflation rate by at least 50% each year. Many definitions list 30% or more each month. Regardless what definition you prefer, the cumulative effects of hyperinflation lead to a worthless currency, often in just a couple of years. So do you really think the dollar will go to zero? If so, you've probably been listening to the marketers on television and the web who have been wrongly positioned as leading experts. These are the same guys who are plastered all over the media for very specific reasons; being an expert isn't one of them. The top investment minds are rarely interviewed by the mainstream media. And when they are, you can bet they aren't there to tell you the truth. They're there to manipulate investor sentiment in a manner that benefits them. I'll show you specific examples of this in the near future. And I will use Warren Buffett as an example. But for argument sake, let's say hyperinflation is a possible outcome. The dollar becomes more worthless each day. Soon, the Treasury starts printing one million dollar notes. Over the next few months they issue one billion dollar notes which won't buy you more than a soda. Later they start printing $10 billion dollar notes and so on. You need to understand that hyperinflation occurs with sub-par second and flat out third world nations that have tremendous instability; economically, politically and socially. While some of you might argue that America is currently unstable, it's certainly not anything like that seen in Argentina , Zimbabwe or Eastern Europe . And it won't ever be, at least in our lifetime. Those who think Washington would allow hyperinflation simply fail to understand how things work in the real world. In the real world, Washington would find a reason to go to war before allowing hyperinflation to kick in. In the real world, Obama is not calling the shots. But that's an entirely different topic of discussion. Sure, I know the federal debt is $11 trillion (the real debt is much higher). In fact, based on my forecasts, it could triple over the next decade. And yes, I understand the massive bailouts and the near 0% short-term interest rates. Based on my forecasts, America is going to have eye-popping annual budget deficits for years to come. Only off-balance accounting tricks can hide what will be an inescapable decade-long period of massive annual deficits. As well, I expect several trillions of dollars to go towards additional bailouts and stimulus packages over the next couple of years. Washington will keep throwing money into the fire pit until they see signs of improvement. Now stop and take a step back. While America has many problems, it's still America . It's still the most powerful nation on earth. Don't get me wrong. Things are a mess and have been for many years. The working class keeps getting squeezed. Job quality has been in decline for two decades, while incompetence and fraud in Washington and corporate America continue to reach new highs. America 's enormous debt is going to skyrocket….guaranteed. But that doesn't necessarily translate into hyperinflation. In America 's case, it most certainly won't; not in our life time anyway. Now ask yourself the following questions. Does America still have the world's leading economy? Does America still have the world's leading military? Does America still lead the world in technology and innovation? The answer to all three questions is yes. However, the gap is closing. And at some point in the future America could find itself in a period of instability that ultimately leads to hyperinflation. But over our life time, it's not going to happen. Nations just don't jump from top to bottom over a couple of decades. It takes many decades of devastating financial mismanagement, societal, economic, and political demise. While America has certainly been on this course for some time, it is still nowhere near the levels needed for a hyperinflationary environment. Even if it were, remember that America has the biggest guns, and would certainly go to war to fend off hyperinflation. One thing is for sure. American living standards have been bumped down considerably more than their two-decade trend of gradual decline. And if this recent deceleration in living standards becomes a new trend, hyperinflation is a very real possibility; but still, not in our lifetime. You should question the motives and/or credibility of anyone preaching hyperinflation. Always remember, extremist views no matter which side of the pendulum are equally dangerous. Perma-bulls are equally as insidious as perma-bears. In order to be a great investor you need to be realistic. You need to know when the tide shifts. But you also need to know by how much. You need to keep an open mind and broad perspective. Why do I even mention the topic of hyperinflation? Because I've received countless emails from average Joe's who've been brainwashed by others claiming hyperinflation is coming. As a consequence, they've asked me whether they should take all of their savings and buy gold or invest in foreign currencies. This is a dangerous move for non-professional investors. Trading your dollars for gold and foreign currencies is a sucker's move for the average Joe because America isn't going to see Zimbabwe-type devaluation. Therefore, without true hyperinflation, currency trading/hedging should only be a strategy for experienced investors who know WHEN TO ENTER AND WHEN TO EXIT. Otherwise, you'll get blasted. That said, the real dollar crisis has not yet occurred in my opinion. However, that doesn't mean that Joe should invest in foreign currencies because it's still the dollar and it will eventually recover. If you do not understand this, you have either been listening to too many people trying to sell you gold, or others trying to manipulate the currency and gold markets. While I believe the real dollar crisis is ahead of us, the dollar certainly isn't going to zero or anywhere close to that. Now, it may drop pretty low in the coming years. But it will be temporary. And it certainly won't fall to zero or close to it because America isn't going to experience hyperinflation. Any real threat of this will be countered by war. So if you want to bet on hyperinflation, you might want to look at Europe, Russia or some third world nations. As for America , it's just not going to happen. Understand this. Anyone can take the most outrageous position on something and given time, it's likely to occur. As they say, eventually it rains in the desert. All of the doomers who have been predicting demise for fifteen years might look like geniuses now. But the fact is they have no credibility. The very best experts will know when the tide changes. They will know what to watch out for when the early signs appear. So if you are one of those guys betting on hyperinflation in America , you might be right. But it isn't going to happen in our life time. So good luck. Now, if you want to know more about the problems America faces over the next decade and beyond, if you want to know more than 99.99999% of the population about America's problems (including everyone in Washington) and how to fix them, you should read “America's Financial Apocalypse,” (preferably the original extended version). And if you're a serious investor seeking to understand the investment process, you must read my new book, “The Wall Street Investment Bible, Volume I.” Warning: All of my books are big, long and very detailed, so if you want some quick easy read with no meat, stay clear of my books. I want to encourage all who seek the truth and valuable guidance to follow me to my new site www.avaresearch.com (coming in a few days). You won't see me pitching gold or investments to you like others. You will continue to receive nothing but unbiased top-tier insight, education and commentaries. so don't invest in gold because "Gold is being manipulated by the big banks, so it could come crashing down from here"...I see...it makes sense. and what about the dollar instead?? The dollar is much safer! sure!! The dollar was and is actually not only MANIPULATED but also CREATED OUT OF THIN AIR by the big banks on the principle of the fractional reserve system and after the removal of the gold standard by nixon in 1971. Between gold and dollar no doubt gold is safer! I think you are right, hyperinflation will not occur. But you will get close enough to make any holder of paper money look a fool. There is an increasing urge to implicate everybody in this crisis of greed and corruption, manipulated by the banks! Where is the reward for the savers. lousy interest rates, and taxed too, returning less than inflation. Investing in the stock market and getting fleeced! I don't want to sit in front of my computer to get in and out of the market to try and salvage my pension!!! The big brother attitude of most states is that we will take from you what we need, by hook or by crook. I simply don't believe people will stand for this unmitigated theft. I'll tell you what. I'll stick to my gold, at the moment I trust no-one. 14 Mar 09, 15:39 Nations just don't jump from top to bottom over a couple of decades. you wrote: "Nations just don't jump from top to bottom over a couple of decades." Complex systems in general can jump to singularity without warning. Ice Age needs just couple of year to develop. Tornado needs hours. Atmospheric electricity discharges within a split of second and this may happen even out of blue sky.. I never believed that communist regime in Czechoslovakia would break within a month. And as of the US dollar... The condition are already set. Nobody knows if it ever happens or not (neither me, you, nor Bernake) but if it happens, most probably it will be sudden and quick. Go ahead and keep your worthless dollars, that way there will be more gold availible for the rest of us! "The full measure of the nation's plight is revealed in Hillary Clinton's first trip as Secretary of State. It was to China, to beg them to fund Obama's new fiscal deficits. Without loans from China, the U.S. economy cannot be revived. The significance of this cannot be overstated: the U.S. no longer exercises sovereignty over its own economic affairs. That sovereignty now resides in the hands of China, the U.S.'s greatest long-term rival. Thanks to Republican policies of massive debt and shipping jobs abroad, the U.S. has technically become a colony of China. It exports raw materials and imports finished goods, together with the capital to make up the difference. Should the Chinese decide not to lend the trillions of dollars the U.S. is begging for, the U.S. economy will implode, plummeting onto itself in a World Trade Center-like collapse that will leave dust clouds circling the planet for decades. " This article is not based off of any credible research into how the Dollar Ponzi Scheme is actually setup but is 100% based on opinion. I recommend you go to wikipedia.com, type in hyperinflation and read the definition. The U.S fits the definition exactly. First the Dollar is a Fiat currency meaning it is backed by nothing. Second, it can only maintain it's value by outright lying to the public about govt statistics (such as employment, inflation money supply etc). Third, the currency issuer (the fed in this case) drastically increases the money supply (which has been happening at an increased rate since the beginning of Bush's first term) and fourth and final stage is buying it's own debt (or monitizing its debt) which just happened today. China is not willing to buy US debt anymore so to prevent a total collapse of the US economy and US dollar it now has to buy it's own debt. We are now (I believe based off of rational solid research) that we are now in the beginning stages of much higher inflation and possibly hyperinflation. Get your financial affairs together people and BUY GOLD!!!! Nevertheless this is what happened yesterday, but few seem to have noticed. For an international investor, investing in US shares, this is the net result of the FEDs announcement of quantitative easing (money printing)as he would have seen the 1.2% fall in equities, plus the depreciation of the dollar on top. So just in order to remain in the same spot, the US markets should have rallied yesterday to make up for the currency loss. That didn't happen. Gold went from a low of about 880 to close to 950 US, largely reflecting the loss in the US currency. Now it is early days, and maybe, just maybe Bernanke actually knows what he is doing, but I seriously doubt it; to me it looks as if the US have an incompetent administration, busy doling out the family silver. 10% in one day! maybe hyperinflation is not that remote. Gold is making all time highs daily. 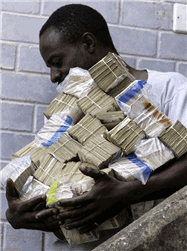 Zimbabwe Ben is printing money via QE2 and the FED is talking about QE3. Also, the November 2010 Federal deficit was $150 Billion. Hyperinflation used to be a country or reginonal problem. But it seems that we humans are headed for the first Planetary hyperinflationary episode!